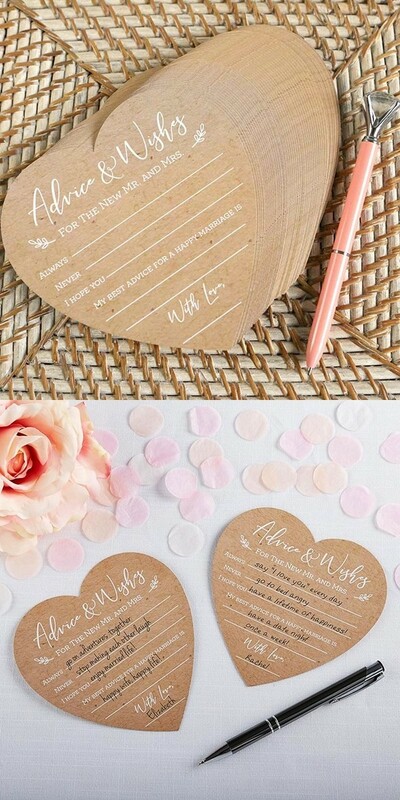 Encourage the wedding guests to share their best wishes and advice for the newlyweds with these heart-shaped well wishes cards. Made from sturdy Kraft-colored cardstock with white-printed prompts, the cards create a reception activity that allows guests to share their words of wisdom to the couple, which the couple can then treasure forever inside of a special box or a wishing well. PLEASE NOTE: Pictured pens, flowers and confetti are not included. Sold in sets of 50 and prices quoted below are per set.